Rookie CB Jalen Mills has not acted like a rookie this spring. 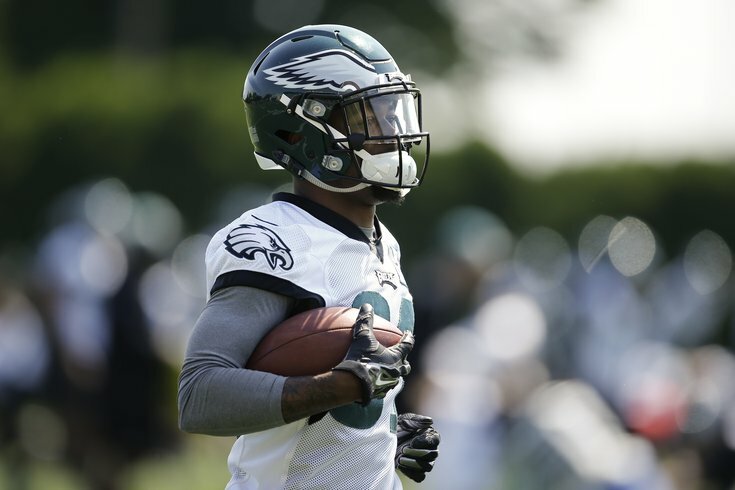 When Doug Pederson was asked in his final minicamp press conference on Thursday which rookies (Carson Wentz aside) he thought have stood out this spring, Pederson paused for a few seconds, and named CB Jalen Mills first. "I love his competitiveness," said Pederson. "I love the aggression that he has playing that position and he doesn't back down from any of our veteran receivers or tight ends or any of the guys that you normally might see on a normal basis might do that. He's challenging guys. He's got great quickness and transition in and out of breaks; smart kid; eager to learn. Those are things that really have stood out with me." Mills has gotten an extended look as the nickel corner with the first-team defense, and he looks like he might be a player. He plays with confidence, trusts what he sees, and goes after the football. All throughout OTAs and minicamp, he has been able to get hands on the football. He doesn't look at all like a rookie, which kind of makes sense, seeing as he has played for years in the SEC at LSU. At LSU, Mills had to go up against receivers like Odell Beckham Jr. and Jarvis Landry every day in practice, which Mills thinks made him a better player. "Jarvis and Odell, every day, their tempo was 110 percent," said Mills. If you weren't on your 'A game' every day at practice they were going to embarrass you. Those guys did prep me a lot just going toward being technically sound and being able to cover those guys. It was big." Safety Malcolm Jenkins agreed that facing top-level competition every day in college is a benefit when making the jump to the pros, as he came from a similar background at Ohio State. "I had Ted Ginn, Santonio Holmes, Anthony Gonzalez who was a first rounder, Brian Hartline," said Jenkins. "When I got drafted into the league, it wasn't a big deal going against the starting receivers. I was definitely prepared for that. "Jalen has been playing well. He jumps off the tape. He's explosive. He's making plays. He has his raw moments every now and then, but he's looked really comfortable out there with the two's, and he started getting reps with the one's. I think he's definitely competing to not only make the team, but be in the starting lineup. There's a lot of competition and it's still early, but I think he's thrown his hat in that conversation." "He's not afraid," said wide receiver Jordan Matthews. "He'll come up there and get in my face whenever we're working plays. If he wants to be physical, he's going to be physical. He's not going to back down. And then after some practices, he has pulled me aside, and said, 'Hey let's get some extra releases.' So you know that willingness to work is also there too. I like him a lot. I think he's definitely going to play a lot for us this year." Speaking a couple weeks ago, Jim Schwartz tried to rein in his enthusiasm for Mills, but did acknowledge that Mills has been impressive. "He's been impressive so far," said Schwartz. "But we haven't really even started yet, to tell you the truth. He's got a lot to learn, and his head's probably swimming a little bit. But what he has shown is he's a very good athlete. He can play the ball, and he's comfortable being on an island. I think if you were check-marking things for corners, those would be three near or at the top."